Do you dress-up your Miniature Schnauzer for the holidays? 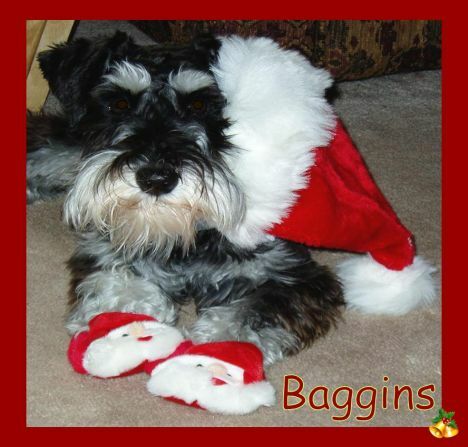 If so, we would love for you to share your Schnauzer Christmas photos. NOTE: All entries must include a story of at least 150 words to be accepted. If you like, have your Mini Schnauzer write a letter to Santa Paws as part of your Schnauzer Christmas Photo submission. Here's and example from our very own Miniature Schnauzer SAMSON! To upload your Schnauzer's photo, simply click the browse button and find the photo you would like to enter on your computer. Then select it. Easy! Simply click on any of the links below to see more Miniature Schnauzer Holiday photos and stories from site visitors just like you! Gumby & Wiston say, "Have a Happy Barky Christmas!" Miniature Schnauzers Jack and Jorja (the kids) having their picture made with Santa. They had just been to the groomer. Bella barked she wanted to wear a pretty dress for Christmas this year. Scooter said he'd just as soon sleep in on Christmas day so he got pajamas. 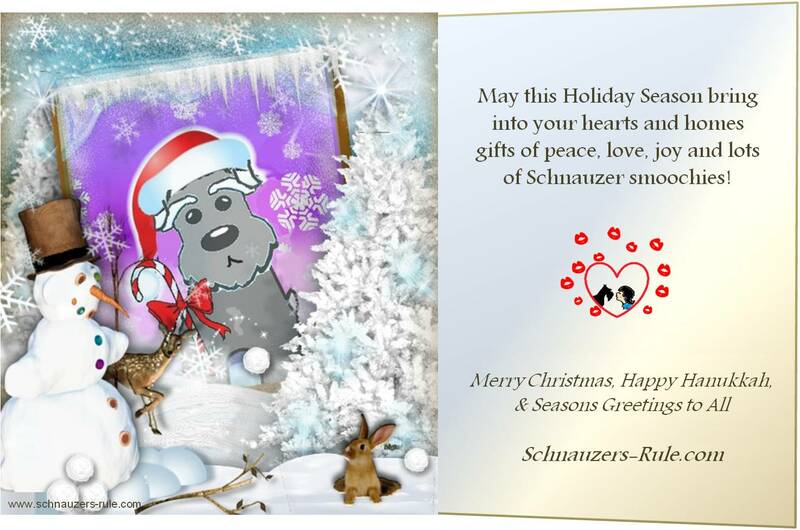 Here's our special Schnauzer Holiday Card for you! The video above is from a dog school in Hungary that uses the Mirror Method. The Mirror Method comes from the idea that dogs will reflect their owners behaviors. The training involves building up the human and dog relationship and ranking order, socializing dogs with other dogs, teaching positive reinforcement with clicker use, and incorporating the dog's natural instincts during play and training.